1. Calculate wavelength of dipole using the formula Î» = c/f, where c= 3*10 8& f is the frequency. Click on the 4nec2 software shortcut icon present on desktop and then click on file option chooses open our saved notepad file. 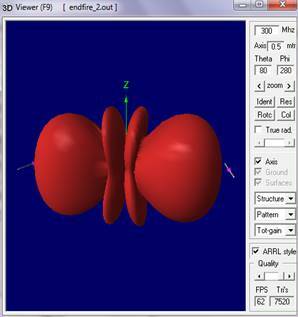 Then select save and then click on structure is resized Ok.
Then choose geometry option. In type option we are making wire antennas so choose type is wire. Next option is tag which is a voltage source so it should keep as 1. Next is number of segments here we can choose any odd no. E.g. 3, 5, 7, 9, 11, 13........ In X, Y, Z we can write the length of our dipole as here our dipole is on Y axis so we given lambda/2 value on Y axis. Next is the radius of dipole i.e. thickness of conductor. 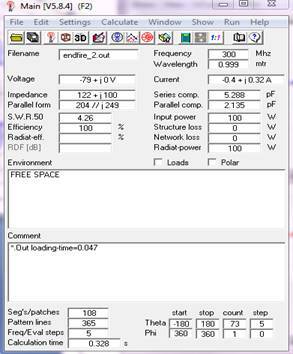 Then click on source/load option and specify voltage. Then click on Frequency/Ground, and then specify the frequency and ground. Select frequency as given frequency, Environment= free space. The next step is calculation of radiation pattern for that click on green book icon on main window for generating output select far field pattern option. 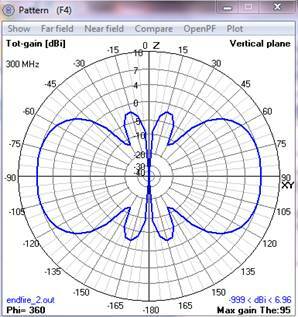 If we want to see 3D radiation pattern of antenna then click on 3D option on main window. Take the print out for Geometry, Radiation pattern in 2D and 3D. Î» = 3*108 / 300*106 = 1m. 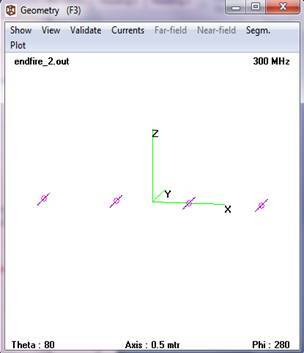 In Endfire array the maximum radiation is parallel to axis of antenna array i.e. at either 0o or 180o and beamwidth can be decreased by increasing number of elements. 1. Model the Endfire Array.